Before the Days of Fire there were no Beastkin! When the invaders appeared so did they. They are young, and eager, acknowledged by the gods as their children.They live brutal, short lives fighting in a war they know little about. It is said that they were created by the Gods to aid the battle against the forces of darkness; the orcs and their undead allies, but only now is some of the truth coming out. We might have been wrong about them. Only a handful know the real story, and it certainly isn’t the Beaskin themselves. 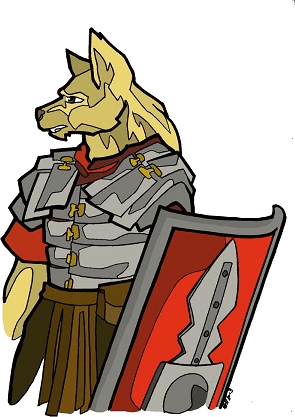 The largest contingent of Beastkin are the Legio Canis, a canine army which holds a defensive line of stockades and border forts built on the Southern edge of the Kingdom of Elland’s border with the Orclands. In all parts of the Northern Alliance you can find other Beastkin aiding where they can; be they reptiles from the swamps in Deepmoor, bird folk from the Mountains in Styrmont, and predatory feline kin from the forests of the Theocracy. To-date no aquatic, nor insect based ‘kin have been found. A prosthetic is an essential requirement for all Beastkin, along with ears (where relevant). Face paint should be used in addition to a mask, not in place of one. Should you wish help with the requirement please contact one of your camp referees and discuss you costume. Chronicles of Narnia by CS Lewis, The Dark Crystal, Were-creatures.